This book analyses the revised European Neighbourhood Policy (ENP) which entered into force in May 2011, thereby replacing its predecessor of 2003/2004. 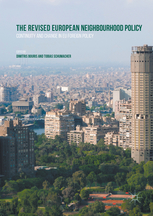 The edited volume provides a structured and comprehensive overview of the most recent developments in EU foreign policy (EUFP) towards the EU’s southern and eastern neighbourhood through the prism of continuity and change. By critically examining EU action and inaction in the framework of the 2011 ENP, it also puts the ENP's most recent review of 2015 in perspective. Topics covered include: conceptual, theoretical and methodological issues; the legal and institutional aspects of the revised ENP and the changes brought by the entering into force of the Lisbon Treaty; and conflicts and crises in the EU’s neighbourhood, such as the Western Sahara conflict, the Israeli-Palestinian conflict, the South Caucasus conflicts and the crisis in Ukraine. The authors also focus on sectoral cooperation, analysing the changes brought by the revised ENP of 2011 in the domains of energy cooperation and migration. This volume will appeal to scholars and upper level students in EU/European Studies, International Relations, Political Science, as well as practitioners and policy-makers in the field.